It has been quite awhile since I did some cartoon nail art design. 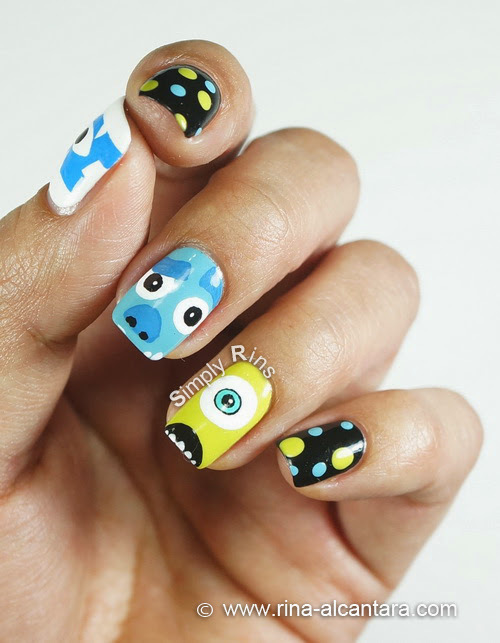 But since Monsters University is now showing in the theaters, I thought it was a good excuse for me to do some cartooning on my nails. Let me tell you this early that I am not so proud of how this mani turned out as a whole. But I love how my version of Mike Wazowski turned out. I think I might have painted James P. Sullivan like a pig of sort? Regardless of the results, I chose not to watch the movie without appropriate nail art! Not so good eh? I wasn't even sure if the polka dots worked at all! I hand-painted Sullivan and Mike using acrylic paints and a detailing nail art brush. I also used a dotting tool for the random polka dots on all the other nails. I think I enjoyed the movie more than I enjoyed doing this nail art. Something seems really off. It's like the colors themselves are not coherent. Oh well, I guess there will always be moments like this when you cannot fully satisfy your own standards or expectations. I'm sorry you aren't happy with this nail art - I LOVE it. I like that it isn't too literal - just close ups of two faces instead of trying to draw their entire bodies. Sully's eyebrows are awesome, and I think the colors for the dotted nails keep it a little more sophisticated rather than childish. Hi Rina! 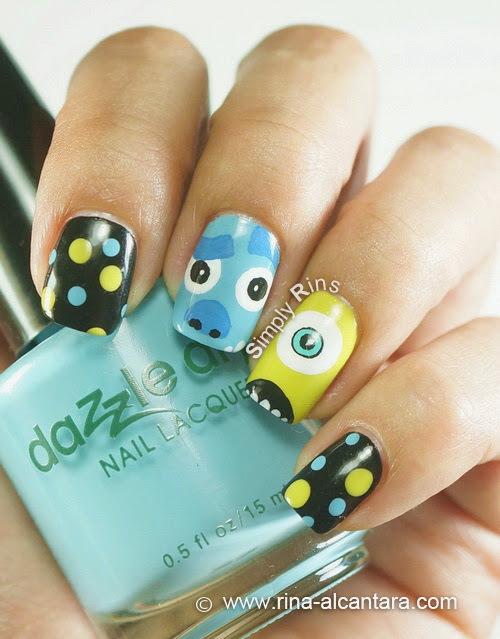 It's brilliant nail art yet again :) it's fun and sophisticated at the same time! I think they look great!! I just watched the movie two days ago, and I could totally get the feeling of it from your nail art!! it's super cute!! oh gosh.. it's so pretty! i think u have started a new trend.. black with polka dots is chic and cute! You always amaze me with your flawless design! Go, MU!